Some of us hold suicide doors closer to heart than others, and Opel seems to be becoming a brand seeking to embrace us in all sorts of suicidally sound door configurations. The Opel Meriva Concept is a heavy hint at the next generation of the mini-minivan offering from Opel and among many features, it's replete with some mighty well-crafted suicide portals. Oh sure, that's not what they are going to call them. We're sure they'll use some kind of excuse like "a negative connotation" or "could cause protests from family groups," but whatever, that's just what everybody is going to call them. It's the way of the world. You don't see a GM car with a truck-bed and think immediately "it's a truck-car." No, you think "Hey, it's an El Camino." We don't care if does happen to be a GMC, the instinctual thought is "El Camino." Where were we? 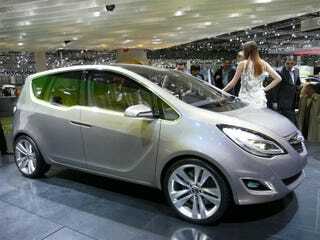 Oh right, the Meriva. The Meriva was part of a mob scene at the Opel stand earlier today — as Japanese photographers grappled with Italian "elbow" Press and yours truly was caught in the middle. So please forgive the chaotic feel of some of these photos. Overall the Meriva is a very nice little hauler, the cabin feels airy and the doors give a wide berth to anyone attempting entry. They also make possible the rare, "elegant rear seat exit." So it could be very popular with the celebrities seeking to limit the number of exposures of their own private "Britney." What? They don't want a practical car they can also use for the award shows? A shame that is. A real shame.